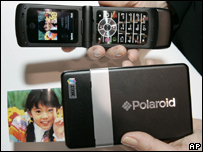 Polaroid is focussing on technology for the digital age. Polaroid, the company behind the instant camera, is to stop making the film used in its iconic technology. The firm is to close factories in Massachusetts in the US, Mexico and the Netherlands after the digital age left almost no market for the film. Polaroid stopped making the instant cameras themselves about a year ago. It now focuses on other ventures which include a portable printer for mobile phone images, and Polaroid-branded digital cameras. "We're trying to reinvent Polaroid so it lives on for the next 30 to 40 years," the firm's president, Tom Beaudoin, told the Associated Press. The firm was founded in 1937, making polarised lenses for the science world, introducing its first instant camera in 1948. Polaroid peaked in popularity in 1991 when its sales - mainly instant cameras and film - hit close to $3bn. However it failed to embrace the digital photography revolution and went bankrupt in 2001, before being bought, four years later by a Minnesota-based consumer products firm, Petters Group Worldwide. It says there is enough film in stock to last until 2009, and it hopes to sell licensing rights to another firm to continue supplying enthusiasts who still use their Polaroid cameras.